Gerald Epstein is a professor of economics and Co-Director of the Political Economy Research Institute (PERI) at the University of Massachusetts Amherst. Juan Antonio Montecino is a doctoral student in economics at the University of Massachusetts Amherst. This is an excerpt from a report Epstein and Montecino wrote for the Roosevelt Institute. The full report is available here. What has this flawed financial system cost the U.S. economy? How much have American families, taxpayers, and businesses been “overcharged” as a result of these questionable financial activities? In this report, we estimate these costs by analyzing three components: (1) rents, or excess profits; (2) misallocation costs, or the price of diverting resources away from more productive activities; and (3) crisis costs, meaning the cost of the 2008 financial crisis. Adding these together, we estimate that the financial system will impose an excess cost of as much as $22.7 trillion between 1990 and 2023, making finance in its current form a net drag on the American economy. First, we estimate the rents obtained by the financial sector. Through a variety of mechanisms including anticompetitive practices, the marketing of excessively complex and risky products, government subsidies such as financial bailouts, and even fraudulent activities, bankers receive excess pay and profits for the services they provide to customers. By overcharging for products and services, financial firms grab a bigger slice of the economic pie at the expense of their customers and taxpayers. We estimate that the total cost of financial rents amounted to $3.6 trillion–$4.2 trillion between 1990 and 2005. Second are misallocation costs. Speculative finance does not just grab a bigger slice of the pie; its structure and activities are often destructive, meaning it also shrinks the size of the economic pie by reducing growth. This is most obvious in the case of the financial crisis, but speculative finance harms the economy on a daily basis. It does this by growing too large, utilizing too many skilled and productive workers, imposing short-term orientations on businesses, and starving some businesses and households of needed credit. We estimate that the cost of misallocating human and financial resources amounted to $2.6 trillion–$3.9 trillion between 1990 and 2005. Adding rent and misallocation costs, we show that, even without taking into account the financial crisis, the financial system cost between $6.3 trillion and $8.2 trillion more than the benefits it provided during the period 1990–2005. On top of this is the massive cost of the financial crisis itself, which most analysts agree was largely associated with the practices of speculative finance. If we add conservative Federal Reserve estimates of the cost of the crisis in terms of lost output ($6.5 trillion–$14.5 trillion), it brings the total amount of “overcharging” to somewhere between $12.9 trillion and $22.7 trillion. This amount represents between $40,000 and $70,000 for every man, woman, and child in the U.S., or between $105,000 and $184,000 for the typical American family. Without this loss, the typical American household would have doubled its wealth at retirement. These excess costs of finance can be reduced and the financial sector can once again play a more productive role in society. To accomplish this, we need three complementary approaches: improved financial regulation, building on what Dodd-Frank has already accomplished; a restructuring of the financial system to better serve the needs of our communities, small businesses, households, and public entities; and public financial alternatives, such as cooperative banks and specialized public financial institutions , to level the playing field. Financial rents are the excess incomes that operators and investors in the financial sector receive over and above the incomes they would need in order to induce them to supply their financial products or services in an efficient, competitive, capitalist economy. (See Stiglitz, 2015 a, b) for a recent discussion of the meaning of rent in this context.) Financial engineers who make twice as much income as they would if they were regular engineers, or financial CEOs who make 10 times as much income as they would if they applied their talents to manufacturing firms, much less government service or teaching, are earning rents. An asset manager who makes twice as much as she would make if she gave an investor full information about a more appropriate investment than the one she is recommending is also earning a rent. Another example is a hedge fund connected to a bank that makes a killing by investing in a highly leveraged, risky asset that then goes bust and is bailed out by taxpayers. Hence, the counterfactual is a traditional one: What would these financiers’ income be if the financial system operated the way mainstream economics often imagines it does—that is, competitively and efficiently? Note that by assuming efficiency as the counterfactual in this way, we actually underestimate the costs of the financial system by excluding all the ways in which our speculative system misallocates resources and generates financial instability and financial crises. We take these costs into account in our next two categories. The second cost is the cost of lower incomes that arise from allocating too many financial and human resources to the speculative financial sector and away from other activities that are more productive at the margin. The economics literature has come to call this “too much finance,” after one of the best-known academic papers in this area (Arcand et. al, 2015; see also Checchetti and Kharroubi, 2012, 2015). This literature shows that countries that have financial sectors that are “too big” tend to have lower economic growth. While this literature analyzes, in the first instance, the size of the financial sector, its results are most likely also picking up the low-productivity types of financial activities in which speculative financial systems engage. Using this literature, we estimate the growth costs to the U.S. economy of having a financial system that “is too large” and misoriented. Here, the counterfactual is a financial system that is “the appropriate size” and operates in a more socially efficient manner, using, as this literature does, other financial systems or times as a baseline. It might appear that in adding up the costs of rent extraction and resource misallocation we are double counting; that is, either one or the other would measure finance’s net costs. But in fact, though these two costs are related, they are not the same thing. Rents are zero-sum; they measure the income lost by one group in society (retirees, borrowers, taxpayers) in making excess payments to another group (bankers, rentiers, traders). In principle, it is possible that this would be the end of the story: Paul, the banker, takes an extra dollar from Peter the customer. Period. But in fact, Peter pays more than a dollar because of Paul’s activities. Since Paul is working in finance and not as an architect, schoolteacher, or industrial engineer, the economy might not be operating as efficiently and growing as fast as it could be. This inefficient allocation of human resources might adversely affect many people in the economy. Peter’s wages might go up more slowly; tax revenue might be lower; the government might choose not to hire as many teachers or repair as many bridges The misallocation of too many resources to finance has growth costs in addition to the extra dollar that Paul takes from Peter. Peter is both paying too much to Paul and losing out on higher wage growth to boot. Of course, there is a connection between these two phenomena. More and more Pauls will want to work in finance because of the high profits and rents, and the high incomes flowing to finance will lead it to become too big and too risky. But this is a causal link between rents and excessive growth of finance; it is not double counting. Speculative finance not only gains excess incomes and causes slower long-run economic growth because of the misallocation of financial and human resources, but also imposes costs on society—sometimes very large costs—because of the large financial crises it periodically causes.15 Large financial crises lead to high unemployment, lower output, less on-the-job training, and significant psychological and social suffering. In some cases, these costs can last for a very long period of time. So in order to give a fair assessment of the costs of our current financial system, we must incorporate the costs of financial crises associated with the excessive speculation and destructive economic activities that are now well understood to have been key to the recent economic crisis. Some economists argue that the GFC had multiple causes and so it would be incorrect to attribute all the costs of the crisis to finance. To be sure, the debate about the true underlying causes of the biggest crisis since the Great Depression is bound to rage on for years, if not decades, just as economists still disagree about the causes of the Great Depression of the 1930s. In light of this uncertainty, it might not be reasonable to attribute all of the costs of the GFC to our speculative financial system. After all, it is true that recessions sometimes do happen without financial crises. Nonetheless, there is growing evidence that recessions associated with financial crises are worse than “normal” recessions. Moreover, there is growing evidence that recessions associated with large debt “overhangs” are also worse than those without them. Relevant to this discussion is the large literature that shows that economic downturns associated with financial crises are deeper and last longer than normal recessions (e.g., Reinhart and Rogoff, 2009, 2010; Jorda, Schuarick and Taylor, 2013; Koo, 2008; Mian and Sufi, 2011). Moreover, economic downturns associated with financial crisis are more likely to lead to permanent declines in the productive capacity of the economy (i.e., potential output). As a result, the recession is deeper and longer, and some of the costs are permanent (see Furceri and Mourougane, 2012; Bosworth, 2015). Hence, even if one cannot prove that the GFC was caused by the speculative financial system, there is no doubt that the financial crisis contributed significantly to the overall costs of the crisis. Hence, a key counterfactual in this case is the costs of the great financial crisis relative to the average business cycle downturn not associated with a financial crisis. In making these estimates, we draw on the best research available (Epstein and Crotty, 2013; Philippon and Reshef, 2012; Philippon, 2015; Arcand, et. al, 2015; Greenwood and Scharfstein, 2013; Haldane, et. al., 2010; Wang, 2011). As with all such cost estimates, though these use the best available research, they are nonetheless our best approximations of a complex reality. The issue of possible double counting arises again in this context. Some might argue that it is double counting to include the economic growth costs of both the misallocation of resources (cost number two above) and the GFC. This might be a problem if estimates of the costs of “too much finance” failed to control for business cycles associated with financial crises; in that case, the business cycle costs of financial crises would already be counted. Simon Sturn and one of the authors looked into this potential problem (Sturn and Epstein, 2014). After extensive analysis we concluded that, after controlling properly for business cycle effects, the “too much finance” result holds. In other words, there appears to be longer-run resource allocation costs from speculative finance on top of the costs of the large financial crises with which they are associated. In short, in adding the two costs together, we are not double counting. The Bottom Line: How Much Does Finance Overcharge? What is the big-picture bottom-line cost of high finance? Here we present conservatively estimated lower-bound (left-hand column) and higher-bound (right-hand column) costs. (We do not say upper-bound because we believe even the higher-bound cost is likely to be an underestimate.) We calculate these costs for the period of 1990–2005. In the case of the costs of the crisis, we include the likely costs moving forward to 2023. The rows indicate the category of cost: The first rows (1) are the banker rents and excessive profits. These are calculated in two ways. In the left-hand column we show the estimates based on rent estimates and profit estimates separately as described above. In the right-hand column, our estimate is based on Philippon’s estimates of user cost of finance for the period 1990–2005, compared with the lower estimated costs in the period of regulated finance (1960–1980). These costs are estimated to be in the range of $3.6 trillion–$4.2 trillion (row 1). 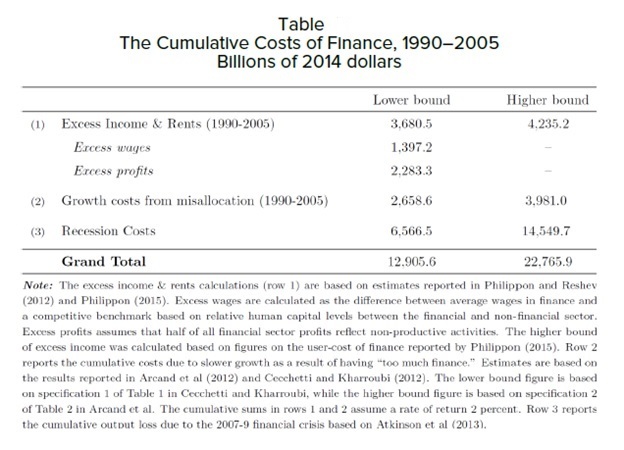 In the second main row, we estimate the costs from misallocation of capital and costly finance practices in terms of lost economic growth, as estimated from the work of Cecchetti and Kharroubi and Arcand et. al. These costs are estimated to range from $2.6 trillion to almost $4 trillion. Finally, we use results from the Dallas Federal Reserve Bank to estimate the costs of the GFC to the economy. Based on their results, we estimate the costs to be from $6.5 trillion to $14.5 trillion (row 3). The bottom-line total is this: The accumulated amount of “overcharging” of finance from 1990 to 2005 is somewhere in the range of $12.9 trillion to almost $23 trillion. These are startling figures, representing as much as $184,000 for the average household in the U.S.
Notice how inefficient this system is: The higher-bound level of rents and excessive profits going to the financial sector as a whole is estimated to be about $4.2 trillion. Yet it costs society as much as $23 trillion—more than $5 for every $1 transferred—to deliver that excess income to finance. This is the very high cost of high finance. All Roads Lead to the Financial Industry: What Is to Be Done? In the end, although there are many markets and disparate products and institutions, it is also true that all roads in finance ultimately lead back to the core financial system with the large banks, hedge funds, and private equity firms at the center. We conservatively estimated that the practices of the large banks and other financial institutions cost Americans between $13 trillion and $22 trillion over the period 1990–2005. Unless something serious is done to alter our speculative financial system, these costs will simply continue to mount. In light of these very high costs, we now briefly address the important question: What can be done to restructure and reorient the financial system so it performs the functions required of a complex modern economy more efficiently, more equitably, and with fewer destructive outcomes? What can be done to address the three costs we identify here: the inequitable and unfair accumulation of rents and excessive profits by important segments of the financial sector; the costly misallocation of financial and human resources to an industry that is so risky and inefficient; and the massively costly risks imposed on society by a financial system that privatizes benefits and socializes risks, such as occurred in the GFC of 2007–2008? Broadly speaking, to address the issues we raise here concerning the enormous costs of our current financial system, we need three broad, complementary approaches: financial regulation, financial reconstruction, and financial alternatives. In addressing financial regulation, it is important to recognize that the Dodd-Frank Act includes some important regulations that can help address some of these costs, especially those associated with financial crises. But Dodd-Frank does not go far enough in certain respects, especially with regard to limiting the size, complexity, and interdependency of financial institutions, and in limiting incentives and capacity in finance for short-termism, lack of fiduciary responsibility, and conflicts of interest. Finally, the too-big-to-fail problem, which privatizes returns and socializes costs, has not been solved. Therefore, Dodd-Frank must be significantly strengthened. Toward this end, it is crucial to bring all financial activities under the purview of regulation, to eliminate the social safety net that allows financiers to take risky activity and impose the costs on society, to bar dangerous and fraudulent financial activities, and to reduce the rewards associated with speculative activities as opposed to socially productive ones. To achieve these goals, we will likely need a new Glass-Steagall law to eliminate the social safety net for highly speculative financial activity, stricter limits on leverage and bank size to break up the largest and most dangerous financial institutions, and stricter regulation to limit financial pay for highly risky activities. The Consumer Financial Protection Bureau’s mandate and enforcement resources should be expanded. It would also be very helpful to implement a financial transactions tax to reduce speculation and short-term orientation (Pollin and Heintz, 2016). Implementing strong transparency and fiduciary responsibility rules for asset managers could help reduce the abuses in the asset management industry. More regulations with respect to limiting stock buybacks may help protect U.S. industry from financial manipulation. While financial regulations are crucial, they will not be sufficient to effectively transform our financial system. Our financial system needs to be restructured so that it better serves the needs of our communities, small business, households, and public entities, such as municipalities and states. Eliminating subsidies for the too-big-to-fail banks will help level the playing field for smaller and more community-oriented financial institutions; however, this is unlikely to populate the financial system with enough institutions to support the needs of our communities. As a result, we are likely to need many more financial alternatives: public banks, cooperative banks, and specialized banks such as green banks and infrastructure banks. The government and the Federal Reserve need to play a role in both leveling the playing field for and helping to support the development of these institutions. For example, a U.S. postal savings bank could be a good alternative to help provide financial services for the underbanked, as suggested by Bardaran (2015). A publicly subsidized worker cooperative bank to support the establishment of worker cooperatives is another idea that has been proposed (Gordon, 1996). Public and socially oriented options in finance will be essential to provide competition for traditional private institutions, and to provide financial services that our economy needs (Epstein, 2010). Financial regulation, financial restructuring, and financial alternatives: All three of these will be required to eliminate or even significantly reduce the high costs that high finance imposes on the rest of us. Arcand, Jean-Louis, Enrico Berkes, and Ugo Panizza. 2015. “Too Much Finance.” Journal of Economic Growth, 20: pp. 105–148. Baradaran, Mehrsa. 2015. How The Other Half Banks; Exclusion, Exploitation and the Threat to Democracy. Cambridge: Harvard University Press. Bosworth, Barry. 2015. “Supply-Side Costs of the Great Recession.” Brookings Institution. Cecchetti, S. and E. Kharroubi. 2012. “Reassessing the impact of Finance on growth.” BIS Working Paper Series #381. Cecchetti, Stephen G. and E. Kharroubi. 2015. “Why Does Financial Sector Growth Crowd Out Real Economic Growth?” Bank for International Settlements Working Paper, No. 490. Epstein, Gerald. 2010. “Finance without Financiers: Prospects for Radical Change in Financial Governance.” The David Gordon Lecture, in Review of Radical Political Economics, 42 (3): 293 – 306. Epstein, Gerald and James Crotty. 2013. “How Big is Too Big? On the Social Efficiency of the Financial Sector in the United States.” Capitalism on Trial: Explorations in the Tradition of Thomas Weisskopf, eds. Robert Pollin and Jeannette Wicks-Lim. Northampton, Ma: Edward Elgar Press. Furceri, Davide and Annabelle Mourougane. 2012. “The Effect of Financial Crises on Potential Output: New Empirical Evidence from OECD Countries”. Journal of Macroeconomics, 34. 822-832. Gordon, David. 1996. Fat and Mean. New York: Simon and Schuster. Greenwood, R. and D. Scharfstein. 2013. “The growth of Finance.” The Journal of Economic Perspectives 27 (2), 3-28. Haldane, Andrew. 2010. “The 100 Billion Dollar Question”, Bank of England. Jorda, Oscal, Moritz Schularick and Alan M. Taylor. 2013. “When Credit Bites Back”, Journal of Money, Credit and Banking, Supplement to Vol 45. December, pp. 3-28. Koo, Richard. 2008. The Holy Grail of Economics: Lessons From Japan’s Great Recession. New York: John Wiley. Mian, Atif and Amir Sufi. 2011. “House Prices, Home Equity Based Borrowing and the U.S. Household Leverage Crisis,” American Economic Review 101:2132 – 2156. Philippon, Thomas. 2015. “Has the U.S. Finance Industry Become Less Efficient? On the Theory and Measurement of Financial Intermediation”. American Economic Review. April, 105 (4): pp. 1408-38. Philippon, Thomas and Ariell Reshef , 2012. “Wages and Human Capital In The U.S. Finance Industry: 1909–2006”, The Quarterly Journal of Economics, Vol. 127 November, Issue 4. Pollin, Robert and James Heintz. 2016. “The Revenue Potential of a Financial Transactions Tax”. PERI, University of Massachusetts Amherst. Reinhart, Carmen and Kenneth Rogoff. 2009. “The Aftermath of Financial Crises”, American Economic Review May, pp. 466-472. Reinhart, Carmen and Kenneth Rogoff. 2010. This Time is Different. Princeton: Princeton University Press. Sturn, Simon and Gerald Epstein. 2014. “Finance and Growth: The Neglected Role of the Business Cycle”. PERI Working Paper, no. 339. Wang, J. Christina. 2011. “What is the Value Added of Banks?” Voxeu.org, December 8.